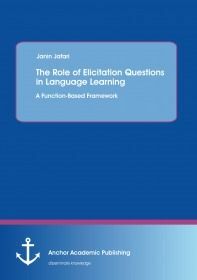 This book presents a theoretical framework of Elicitation Questions. Elicitation questions are the most important aspect of second language learning ability. Understanding the purposes and the conditions in which questions work best will help one master their use. Questioning is not only one of the most important skills in language learning, but also one of the main objectives of learning English in our schools. Although there are a number of definitions, it seems that the term ‘question’ has never been clearly defined. With the changes occurring within the linguistic theories, the term has been characterized in different ways. ‘Questioning’ here refers to the act of asking or putting or using questions through which a good number of functions can be served. The manuscript examines a framework in discourse characterization both in English and Persian, and shed some light on the theoretical description of Elicitations in the two languages. The result has significant implications for those involving in pragmatics, discourse analysis, contrastive analysis, pedagogy and translation.